Analysis: Samuels, who racked up 172 total yards against the Patriots last weekend, is expected to dominate the backfield snaps, leaving Stevan Ridley to handle only a light complementary role. The rookie will take aim at a Saints run defense that has allowed a league-low average of 79.1 rushing yards per game. Still, with double-digit carries and involvement in the passing game presumably on tap, Samuels represents a viable Week 16 fantasy lineup option. Analysis: Samuels should get the majority of the work out of the backfield, similar to Week 14 when the rookie compiled 92 total yards off of 18 touches. Stevan Ridley wound up vulturing a late red-zone touchdown in that contest, mitigating Samuels' fantasy value. With Conner expected to return to the field in Week 16, Sunday's contest against the Patriots might be one of the last opportunities for Samuels to showcase his versatile skillset this season. 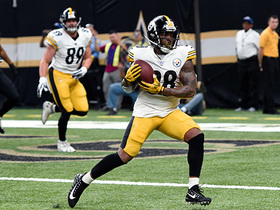 Samuels' role in the Steelers offense could take a hit with James Conner (ankle) questionable for Sunday's game versus the Patriots, Teresa Varley of the team's official site reports. 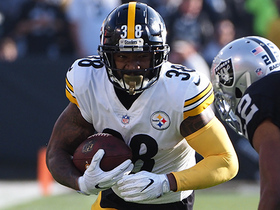 Samuels rushed 11 times for 28 yards and brought in all seven of his targets for 64 yards in the Steelers' 24-21 loss to the Raiders on Sunday. Analysis: Samuels couldn't deliver much on the ground, but he did offer a decent James Conner (knee) impression through the air. The rookie seemed to lack explosiveness on many of his runs, though he also appeared to have precious few in terms of rushing lanes on some of his carries. Samuels could be in line for another starting opportunity in a critical Week 15 matchup versus the Patriots if Conner remains sidelined, though veteran Stevan Ridley could log more than the five carries he saw Sunday. 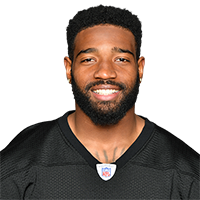 Samuels, who will start Sunday's game against the Raiders, said he received more first-team work than fellow running back Stevan Ridley during the Steelers' practices this week, but only by a small margin, Jeremy Fowler of ESPN.com reports. Samuels indicated Wednesday that he would start at running back in Sunday's game against the Raiders, but added that he and Stevan Ridley are slated to split time, Jeremy Fowler of ESPN.com reports. With James Conner (ankle) out for Sunday's game against the Raiders, Samuels will be included in the committee that coach Mike Tomlin suggested the Steelers will employ for Week 14, Bob Labriola of the Steelers' official site reports. With James Conner (ankle) out this week, Samuels is in line for added work Sunday against the Raiders, Dale Lolley of DKPittsburghSports.com reports. Analysis: Stevan Ridley is also a candidate to see added carries in Week 14, with Trey Edmunds on hand to provide depth, but those scrambling to replace Conner would do well to look into acquiring Samuels to see how this situation unfolds. Samuels ran twice for five yards and caught all three of his targets for 20 yards and a touchdown during Sunday's 33-30 loss to the Chargers. Analysis: The rookie replaced James Conner (leg) and caught a 10-yard touchdown pass with 4:10 remaining that tied the game at 30. Samuels could be in line for a heavy workload if Conner is unable to play in Week 14, when Pittsburgh faces an Oakland team ranked 31st in rushing yards allowed per game (153.3) and 29th in yards allowed per carry (5.0). Samuels caught one of two targets for 12 yards during Sunday's 24-17 loss to Denver. Analysis: The rookie running back was targeted on consecutive plays on Pittsburgh's first offensive possession -- including an incompletion thrown by Antonio Brown on a failed gadget play -- but didn't get another look all game. Samuels now has more receiving yards (34) than rushing yards (26) on the season and serves only as a fantasy handcuff to James Conner heading into Week 13 against the Chargers. Samuels carried five times for seven yards and caught three of four targets for 22 yards and a touchdown during Thursday's 52-21 win over Carolina. Analysis: The rookie benefited from Pittsburgh taking a big lead early in the game, matching his total carries on the season. 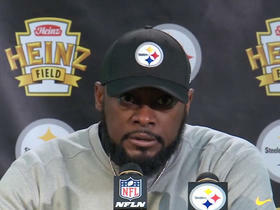 He also caught his first passes and scored his first professional touchdown to cap the scoring for the Steelers. James Conner was removed from the game in the fourth quarter and was being evaluated for a concussion, so there is a chance that Samuels could see a bump in playing time when the Steelers play the Jaguars in Week 11. 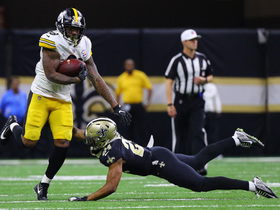 Pittsburgh Steelers running back Jaylen Samuels uses a stiff arm to gain 9 yards on the run. 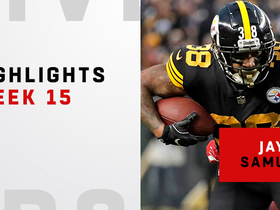 Pittsburgh Steelers running back Jaylen Samuels wins Pepsi Rookie of the Week for Week 15 of the 2018 NFL season. 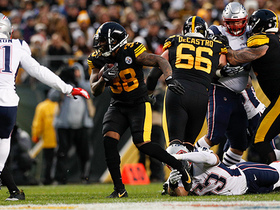 Pittsburgh Steelers running back Jaylen Samuels had 172 total yards against the New England Patriots in Week 15 of the 2018 NFL season. Pittsburgh Steelers quarterback Ben Roethlisberger finds his running back Jaylen Samuels on a big third down for 20 yards. 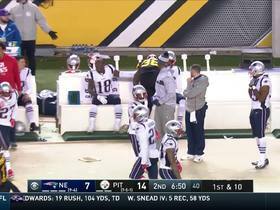 Pittsburgh Steelers running back Jaylen Samuels channels Beast Mode by joining the New England Patriots bench after a 17-yard run. 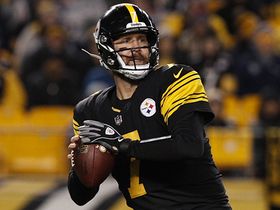 Pittsburgh Steelers quarterback Ben Roethlisberger finds running back Jaylen Samuels for a 23-yard gain.